I remember reading a story in a devotional when I was in college. Maybe it was by Ann Kiemel, since I was reading much of her writings in those days...or maybe not. But the true story was about a young woman who was caught in a burning building. The amazing thing was that this woman escaped because the Lord had told her exactly what to do. She followed the instructions to a T and was safe. I was amazed. God will actually be that specific and that personal...with just one person? Would He be that with me? I had to believe He would. And so the longing intensified. Years later, I discovered the writings of Catherine Marshall, because of her book-made-movie, A Man Called Peter. It was in some of her writings that I discovered that God spoke to her, especially in her illness. Often the Holy Spirit would take His holy highlighter and point out a verse or passage. Sometimes it would just be a direct message, spoken to her spirit...like for the young woman in burning building. God is a Speaking God...not just in the past, but right now, right here, to you and me. Are we listening? Can we hear? I'm learning to hear. I'm "taking the risk" that it actually may be God speaking to my spirit. And there came a time in my life that I needed Him to speak loud and clear...and it was a "that was for this" situation. About fifteen years ago, I was teaching through the book of Hebrews. 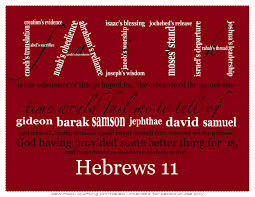 Even though the lessons continued through chapter by chapter, I personally remained stuck in Hebrews 11 & 12. As you may recall, these chapters speak about the Old Testament people of faith, ending with the exhortation to run our lap in the race of faith by focusing on Jesus. Did you catch that? Good things happen to people who live by faith. BUT also bad things happen to people who live by faith. What a revelation! I guess I had expected that as a Christian, if I made godly, faith-filled choices, things would turn out right. How naive! Since my mind was absorbed with these chapters, I decided to use them that year as the key passage for a workshop on Bible study methods that I was teaching at a ladies retreat. Well, at the end of the retreat, as I drove the hour home from Cincy to Dayton, I reflected, "Why can't I get out of Hebrews 11? Why can't I move on to other passages? Why?" Just then the Holy Spirit opened my understanding, "Oh no! God is preparing me for something big, and it's not going to be easy!" Sure enough, when I walked through the door that evening, I discovered that there were some health issues going on with my then 20 year old son Jeremy, a sophomore at Grace College. To make a long story short, within 2 weeks, he was diagnosed with thyroid cancer...a crisis that rocked our whole family. But God had so definitely prepared my heart with His life-giving, life-sustaining words in Hebrews 11...THAT WAS FOR THIS! What about you, dear friend? Are you longing and learning to hear from God? Is there a Scripture that is coming at you in many ways: in song, in preaching, on Christian radio, in your daily devotional reading? Is there a recurring thought that sounds like God and His ways? "Take the risk" (trust) that God is speaking directly to you. He may be speaking comfort, truth, empowerment, preparation, whatever is needed, to your listening heart. That's what it means to walk by faith!